Gemba helps you making your IoT-projects successful, based on the IBM Watson IoT™ Platform. 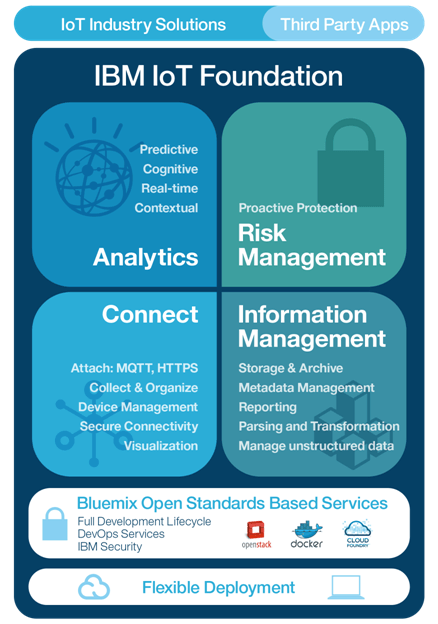 IBM Bluemix is the platform of IBM in the cloud. It is part of an ‘open source’-platform, enabling organisations and developers to quickly create applications and implement and manage them in the cloud. In addition, it is quite easy to integrate with your existing cloud-applications. It is a scalable and safe platform for all types of data and applications. Also ready-to-use services are available. The IBM Watson IoT-platform is the solution for everything concerning the Internet of Things. This can be divided into the 4 areas of interest IBM Watson IoT gives. Connect and control all your IoT-devices, gateways and networks in a broad and growing eco-system. Supports open communication standards, such as MQTT and HTTPS. Safe communication and scalable, from a single device. Supports the risk management while gathering, analysing and storing information. It ensures that you use the correct information from the correct sources and the proper software, where necessary. Combining contextual data, such as the weather, with analyses and sensor data for better results. Improve the visibility of IoT-systems via dashboard and console reporting. Integrate critical data from other information platforms, such as the weather and public sentiment, and use advanced possibilities for data-storage, caching and transformation. Continuously manage and analyse the data of millions of devices in the cloud. It is all made possible by use of the IBM Bluemix platform. With analysis-solutions you make optimal use of the possibilities of the Watson IoT-platform. With auxiliaries like Natural Language Processing, Machine Learning Image, Video Analytics and Text Analytics, any form of data can be analysed and adequate, prescribed actions will be suggested. This way you are able to more quickly respond to changes in your process. For more information about IBM Watson Platform, you can also visit IBM here.